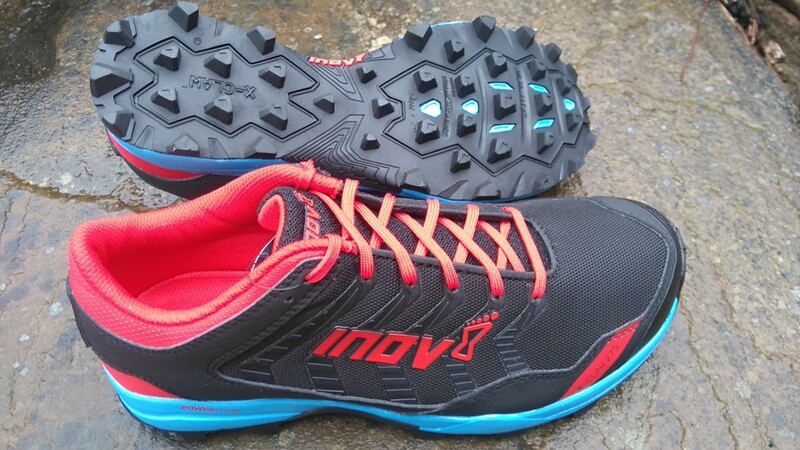 The aggressively soled Mudclaws and X-Talons in their various guises are already well established favourites amongst fell runners; you only need to look down whilst at the start line of any fell race to see that Inov-8s tend to be the shoe of choice. So this being the case you might ask where does the new X-Claw fit in and is there any real need for it alongside its siblings? At first glance you might think that the X-Claw is a new model of Mudclaw. Although not identical the sole unit certainly shares the same aggressive look with triangular 8mm lugs whilst the upper has the durable water resistant material, rand and toe bumper that Mudclaw users will be familiar with. It requires a closer look to spot the differences. Looking at the outsole of the X-Claw you notice a change in the stud pattern compared to the Mudclaw (a design that it shares with the new X-Talon 225) It still uses the “Dual C” mix of hard and sticky rubbers aiming to give both friction and durability . The X-Claw has an 8mm drop (compared to the Mudclaw’s 6mm) with a midsole that is said to give better shock absorption and energy return. A significant feature is that the X-Claw 275 comes in “Standard” fit whereas the X-Talon and Mudclaw are both “Precision” fit. This means that the shoe is wider in the toe box. This may come as welcome news to runners with wide feet who like the grip of the other models but find the precision fit too tight. Likewise, runners doing particularly long distances might prefer the extra cushioning and toe splay that the X-Claw allows. Looking at the X-Claw and Mudclaw together you notice that the shape of the heel cup is slightly different with the heel tab being ever so slightly higher on the X-Claw. Anyway, enough of the technical stats – what are they actually like to wear? Although I’ve had the X-Claws for a while and been keen to give them a blast it’s only recently after a bit of wet weather that I’ve had the chance to try them in the conditions that they are designed for! I wear either X-Talons or Mudclaw 300’s for racing depending on the distance and type of terrain, and Mudclaws for winter training on the fells so I had a good idea of how I wanted them to feel. 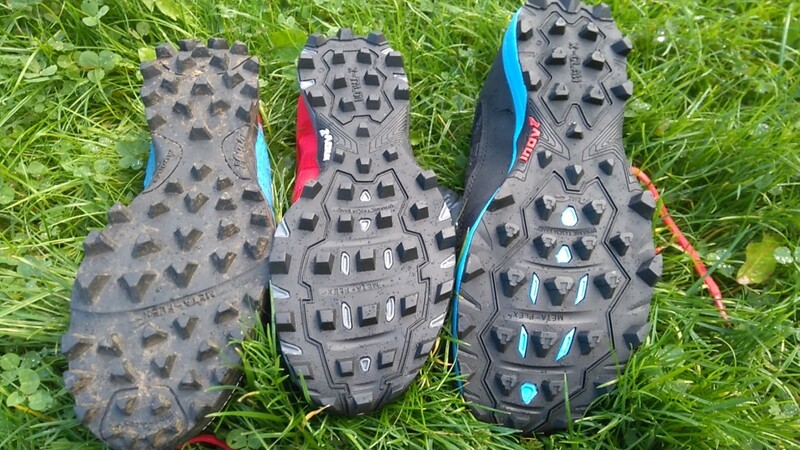 First on they felt comfortable, I’m a 6.5 in almost all shoes and the six and a half were fine (and well done to Inov-8 for going back to making men’s shoes starting in a 6 – saves me having to get the women’s model!) Being used to the precision fit of the Mudclaws and X-Talons I wondered if the standard fit might feel a bit sloppy but it didn’t. I noticed that it wasn’t as tight but I didn’t feel that my foot was moving around inside the shoe. 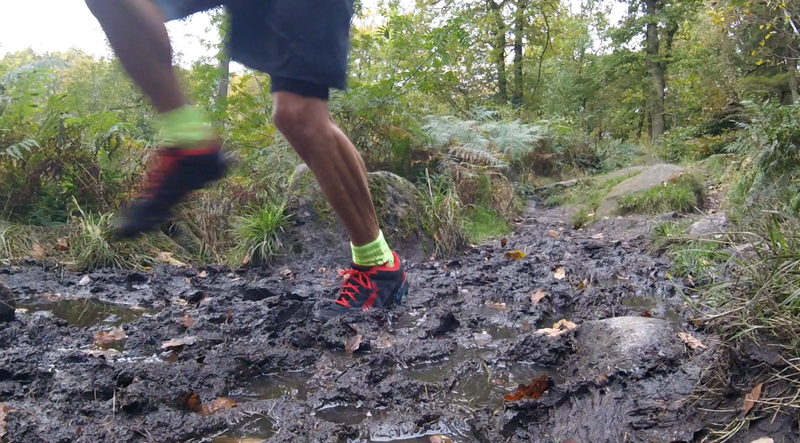 I was pretty confident that the grip was going to be positive even on the wet and muddy stuff, and so it proved as I was able to run quickly through thick mud, hopping over the biggest puddles and landing without slipping. 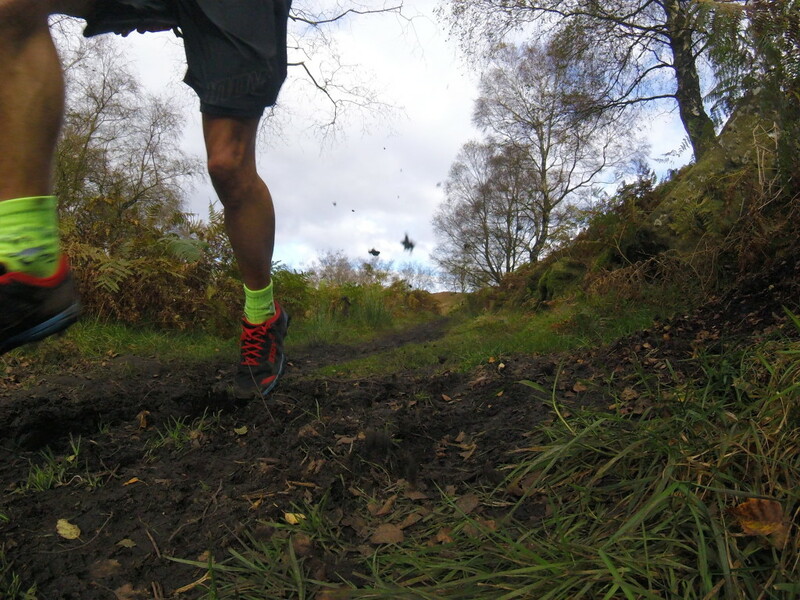 Running on mixed terrain the X-Claws gripped excellently on the gritstone boulders (as expected) but also coped well with thick muddy ground and damp fallen leaves. 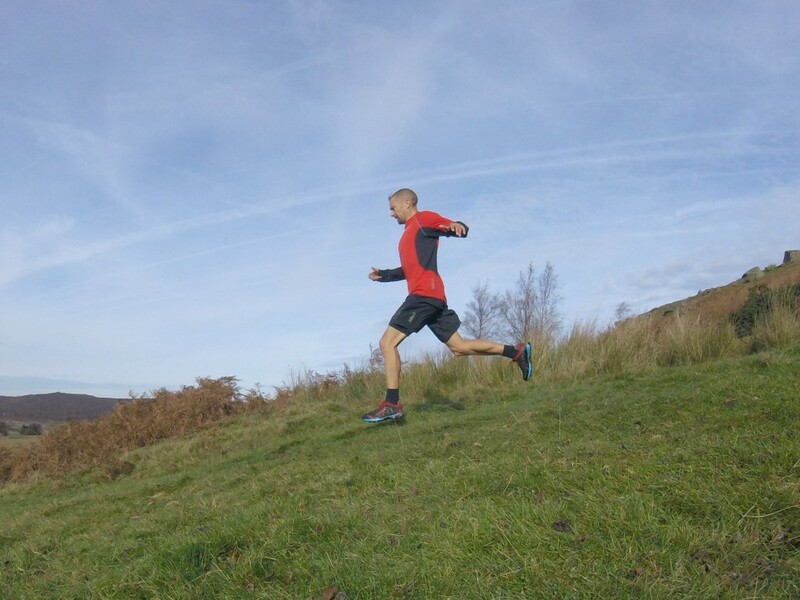 On downhill sections of soft ground they allowed me to run fast with confidence and they were reassuringly grippy on steep wet grass. All this hints that they would make a good race shoe despite not being as snug as my usual choices. My only concern is with the heel tab; I’ve had achilles problems in the past and my old yellow Mudclaws used to aggravate it. However I’ve been using them for 3 weeks now without a problem so hopefully it won’t be an issue. 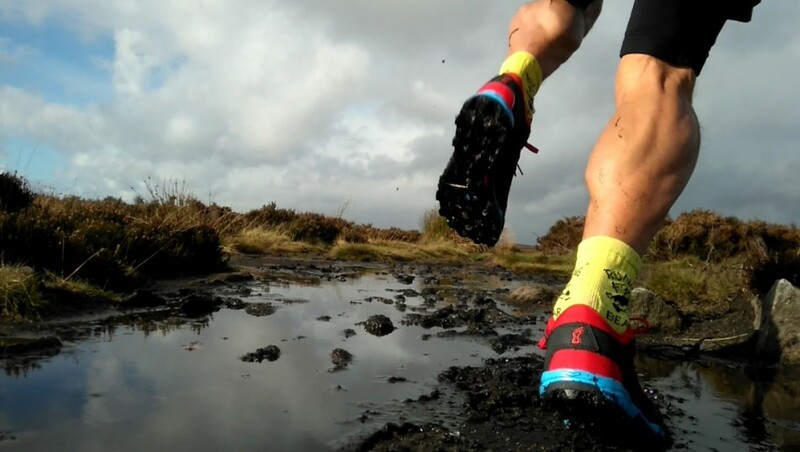 The design of the new X-Claw 275 makes them suitable for longer training or racing over rough, muddy and boggy terrain. That makes them good for most of the year! They will particularly suit runners with wider feet who find the precision fit models too tight. I think that anyone attempting one of the big rounds i.e. Bob Graham, Paddy Buckley or Charlie Ramsay rounds would find the X-Claws to be an ideal shoe. Personally I will be using them as my autumn / winter / spring training shoe on everything apart from hard packed trails whilst saving the X-Talons and Mudclaws for race days. 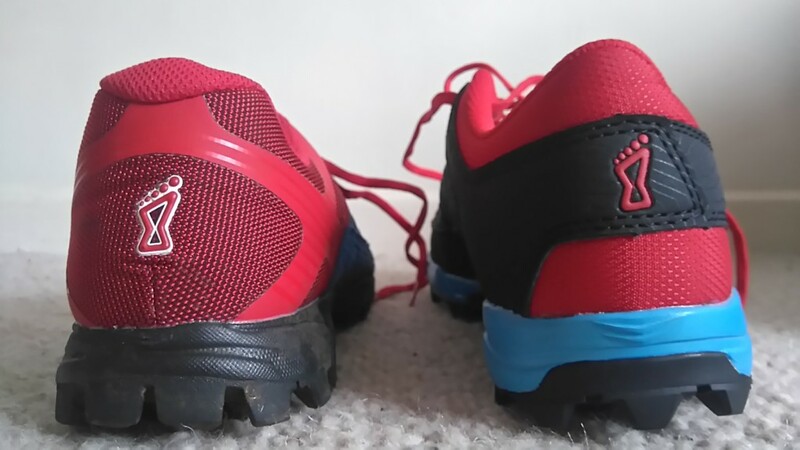 Posted in Equipment, Fell running, Reviews, Shoes and tagged inov-8, X-Claw 275. Thanks for your great review – very helpful. I read somewhere else that the X-Claw 275’s have tungsten carbide studs, which I need to avoid for obstalce course racing. But I don’t see them mentioned on the Inov-8 website. Do you know if they have them or not? The X-Claws definitely don’t have tungsten studs. I think those are on the Orocs. Really useful review! 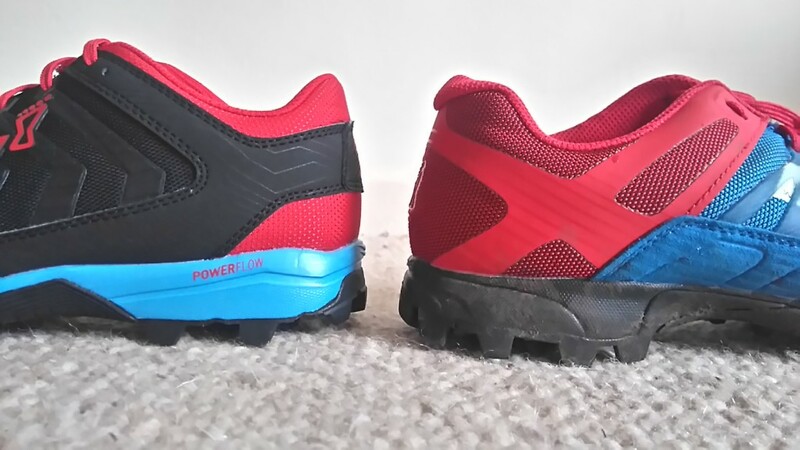 I am thinking of going for the x-claws for an upcoming swimrun race, I have wide feet so think these will be a better fit than most narrow shoes which I struggle with. Did you find that they drained the water well when you did get them very wet? I wouldn’t say they drained fantastically well after they had been fully immersed, they did slosh about for a while! I think the X-Talons probably drain a bit better but understand they might be too narrow. Tricky one. Hi, great review, thanks! I just wanted to check if you feel that the grip rivals that of the Mudclaws? I need the grip of the Mudclaws but the precision fit isn’t suiting me as I tend to get very hot feet and they swell a bit. Hi Amy. The grip is certainly very close to that of the Mudclaw although the studs aren’t exactly the same. I’ve raced in them in on the moors in very muddy conditions in winter with no issues. I’m new to trail running. I wanted a running shoe I could also use for a lakeland marathon but which would also work OK for a treadmill and maybe a bit of road on the way to a trail. In other words probably I need something thats a bit more of all rounder but I’m really attracted by the wide foot fit and the drop (I’m used to road running). For treadmill I’d use a road shoe rather than a trail shoe.